Body Shapes - Which One are You? Do you know which one of the body shapes you are? If you don't, then it is REALLY important to find out! Fashion is not just about wearing current fashion trends. It takes some thought and skill to look classy and stylish. Knowing your body shape is half the battle when it comes to dressing your best. Just because you are plus size doesn't mean there is a universal dress code for big women. And I am not talking about the size "baggy." You have assets to show off, and yes, maybe some flaws to minimize as well. 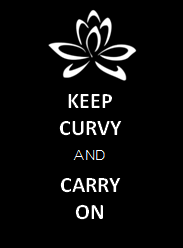 There are ways to create curves if you don't have them and ways to draw attention away from your problem areas too. So if you truly want to look your best and feel your best, you should know how to dress your plus size shape, whatever that may be. Below are some plus size fashion tips and fashion advice for each of the body shapes. Keep these tips handy so you are ready when the mood to shop strikes or when you are tempted to buy a style that is just not meant for you. Body Shapes: What Flatters Your Shape? For tops and dresses wear empire waist styles. The empire seam hits at the narrowest part of your figure which is right under your bust line. A-line dresses are also flattering and should fit at the bust and drape nicely over the rest of your body. Detailed necklines and accessories will draw the eye upwards away from your middle and waist. Wear flared or boot cut pants or jeans so your silhouette is balanced from your waist to pant hem. Wear dark slimming colors like black, burgundy, charcoal or navy in skirts and pants. Wearing darker colors on your problem areas will slenderize your look. Wear colors, prints or patterns on top which keeps the eye from lingering on your hips and bottom. Go with darker wash jeans. Color jeans are very popular now and you can wear them too as long as you wear darker hues. Pants and jeans should be flared or straight legged to create a balanced look. Tapered jeans will only accentuate your larger hips and thighs. Shop for A-line skirts or dresses. Be sure the top of the dress is fitted (not tight). Draw the eye upwards away from your hip area by wearing open necklines. Wear a Bold necklace or brooch or tops with appliqué or embroidery. Wear tops, sweaters or dresses with ruching. Use belts or ties across your midriff to create visual curves and define your waistline. Wear straight leg jeans or pants to create a continuous line from waist to hem for a slenderized look. Go for dresses or tops with an empire seam or a wide inset at the waist to create definition. A fitted jacket or vest that is nipped-in at the waist will give you a waistline and not a boxy look. A-line skirts or dresses create a curvy look and will give you balance between your top half and bottom half. Choose lower, open necklines so you do not look top heavy. Closed or high necklines will make your chest appear larger. Wear fitted jackets with a nipped-in waist or a shaped blazer so your curves are defined. Wear belts or sashes to accentuate your waist. Boot cut pants or jeans will accentuate your curves without making your hips appear larger. Straight cut pants or jeans will hug your curves slightly and draw the eye down in a continuous line from waist to hem. Wear open and slightly lowered necklines. Plunging necklines will show it all. Don't wear bulky sweaters including cowl neck sweaters or turtlenecks. They will make your bust appear larger. Wear dark prints, patterns or solid colors on top. Wearing darker colors on your problem areas will slenderize your look. Wear patterns, colors or prints in pants or skirts with a solid colored top. This will keep the eye from lingering too long on "the girls." A fitted blouse or sweater looks great with a flared A-line skirt or fuller style trousers. A well fitted bra is A MUST so you get the proper support and lift. If you are trying to minimize the size of your bust, try looking for a quality made minimizer bra. plus size clothing;body shapes;What is my body type?